I have been making, wearing and selling copper bracelets since 1969. During this time people often asked: "Will this bracelet turn my wrist green?" My answer has been: "I don't know. We work with pure copper and its alloys, and we guarantee our craftsmanship for our lifetime, but the way a person reacts to copper doesn't depend on us. The only way we know to find out is by trying one on yourself." Most customers like to wear copper and do not care about having an occasional green stain under their bracelets. Other people are very health conscious and, as proof that the copper is working, they expect to see a green mark where copper touches the skin, the same marks that make others feel self-conscious. Ironically, the green copper stains seem to prefer the people who worry the most about getting them. The same bracelet which remains shiny for one person, will turn another person's wrist green, or may acquire multicolored patinas on another. Could these changes be related to a person's metabolism? The answer is Yes! The green stains are caused by deposits of chelated copper and their presence relates directly to the body chemistry of the wearer. Chelated means they are copper compounds in a soluble form assimilable by our bodies. Copper in its pure metallic form cannot be taken in by our bodies, while chelated copper compounds are easily absorbed by our skin. They become visible when the wearer's body dissolves the copper faster than it absorbs it. This happens when there is profuse perspiration (as when exercising on a hot day), or when our sweat becomes more acidic. The acidity of our sweat increases with physical, emotional or mental stress. It also increases with unhealthy diets. Green marks are also believed to appear when the body is hungry for copper. The human body needs more minerals when growing, when pregnant, or when recovering from disease or surgery. A body starving for copper will even manage to dissolve the copper contained in gold alloys and leave marks under 14K gold rings. If you suspect having copper deficiency, please consult your holistic doctor, naturopath or dietician, who by ordering a simple blood test will know the mineral supplements you need to regain balance. As prevention, choose to eat organically grown produce whenever possible. The green stains are normally absorbed overnight, and if needed they wash off with soapy water. If wearers strongly dislike the green marks, they have two choices. They can choose to address the causes and make healthier choices or simply ignore the warning and wear no more copper. It took me nearly 30 years of practical research and collecting data from around the world to better understand this complex copper/green wrist phenomenon. In September 1995, the International Association for New Science invited me to present my findings at their Annual Conference in Ft. Collins, CO. Following are excerpts from my two-hour presentation. - "Copper, when in contact with the skin, form chelates with human sweat (sometimes seen as a green deposit under the bracelet) and is thus absorbed through the skin. Think of a bracelet as a 'time-release' source of copper." Dr. Ray Walker, Univ. of Newcastle, Australia. - "Copper compounds are more effective and less toxic than drugs being used to treat arthritis." Dr. John Sorenson, Univ. of Arkansas. - Copper and zinc (our jeweler's brass is 85% copper + 15% zinc), are two essential minerals needed to sustain human life. The natural mineral contents of commercially grown American produce have been decreasing for the last 30 years. - "Treat inflammation with pulverized copper." From the Eber Papyrus, one of the world's oldest medical texts. - In medieval Europe the famous physician Paracelsus prescribed copper and brass bracelets to treat the "bad mixture of bodily humors." They continued to be widely used in Europe until early this century to promote physical and mental health and to increase male potency (coincidentally a relation between copper deficiency and sterility in cattle has been recently reported). - In 1939, the German physician Werner Hangarter, reported that Finnish copper miners were free of arthritis in spite of rheumatism being a widespread disease in Finland. He proceeded to successfully treat rheumatoid arthritis, neck and back problems with copper compounds. But interest in copper treatments became dormant after WWII, which coincided with the introduction of corticoids, initially hailed as "wonder drugs" until their side effects became better known. I have been approached at shows by countless people who strongly believe that wearing our copper and brass bracelets have helped them to regain their health. Perfect strangers have spontaneously hugged me in gratitude while proclaiming that our bracelets have freed them from pain. Our business has been growing steadily in spite of not using public advertising. Our success depends entirely on word of mouth and on satisfied customers returning to our stores to buy more for their loved ones. Through the years I noticed that there is a certain kind of people who are attracted to our bracelets. They are perky, friendly and fun. However, at shows I have sold bracelets to unlikely characters who did not fit this profile, customers who were stressed out, gloomy, or just drifted into our booth. To my surprise I often recognize those same people coming back days or years later, wearing now perhaps more than one bracelet and looking more energized and alive. Often they drag along a friend and say: "These are the ones I told you about. You ought to try one!" In busy shows I work with several helpers and it is common for us to share over dinner our experiences with the new converts and the most remarkable transformations we have seen that day. From my observations I concluded that people wearing our bracelets seem to enjoy life more fully than their peers who do not wear bracelets. This could happen because the bracelets are probably attracting the ones who are naturally more inclined to decorate themselves, the fun loving members of a group. But what explains the attitude change with the converts? Is it possible that, as Paracelsus believed, wearing copper and brass bracelets somehow improves the disposition of the wearers and their "mixture of bodily humors?" - Arthritis is the number one crippling disease in America. The American Arthritis Foundation calls copper bracelets an "unproven remedy." There is overwhelming circumstantial evidence to warrant clinical trials by the Food & Drug Administration to prove or disprove the therapeutic effects of wearing copper. Having at stake the potential discovery of a new treatment for arthritis, why are those tests not being done? - In the developing world, where people cannot afford expensive drugs, copper bracelets are sold by pharmacists as the treatment of choice for aches and pains. But doctors in the USA are legally prevented from suggesting copper and prescribe drugs instead. As a result of this practice, arthritis sufferers in America often spend more on pain pills than on nutritious food. All those pills have fueled a multi-billion dollar industry for which a copper treatment approved by the FDA would be bad news. Could it be that in their efforts to preserve market share these powerful drug companies are somehow diminishing our resolve to complete the testing of this natural and affordable alternative? - For an entire era of human history, a copper alloy: Bronze, was the most valuable metal known to man. - While Iron is associated with Mars and the "Might is Right" attitude, Copper is associated with Venus and the qualities of nurturing, caring for others, and attracting with beauty instead of coercing with force. - The main temple of Venus is in the island of Crete, in the vicinity of the largest copper mines of antiquity. - In India copper and copper alloy bracelets have been worn since prehistoric times. Paramahansa Yogananda, the first teacher of Eastern philosophy to come to the USA, wrote in his autobiography: "Just as a house may be fitted with a copper rod to absorb the shock of lightning, so the bodily temple can be protected in certain ways." He advised wearing a bracelet containing pure copper next to the skin as a practical preventive way to "counteract the adverse effects of subtle cosmic influences." - Anemia was incurable until it was found to be caused by iron deficiency. Is it possible that arthritis is a symptom of copper deficiency? Having grown up in the Midwest in an auctioneering family, John Paul was raised on buying things used and giving well-made items a second chance to be useful. The attitude of reusing & repurposing things has been in his blood ever since. Be it rummage sales, estate sales, thrift stores, auctions, craigslist or antique stores, he buys absolutely as much as possible, used. Nearly all of his large equipment and tooling is 50-100 years old. Some of his favorite tools include an anvil from Sweden and a fly press from the turn of the 19th century. Most of his smaller hand tools are from the 1940's-70's. He finds great pleasure in rescuing old tools and working them in to his day-to-day operations. 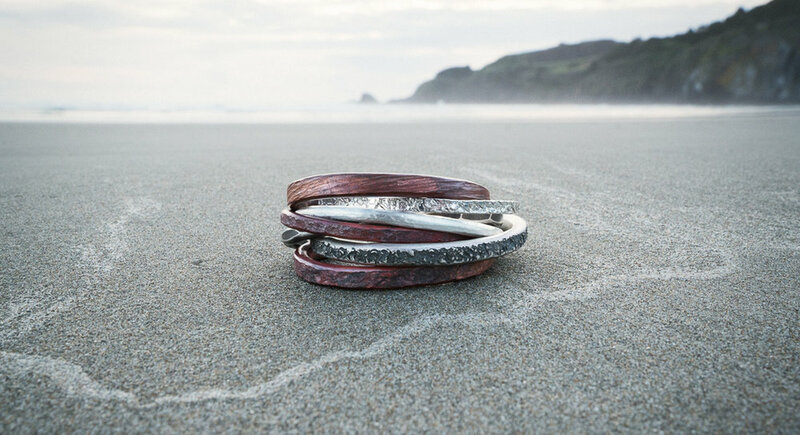 Metals: John Paul Designs strives to use recycled metals whenever possible or applicable. All of the gold we use is 100% post consumer recycled from Hoover and Strong. We also spend time dismantling old jewelry, removing gems, separating the karats and colors and re-using clients' gold and platinum to create new works of art with their "recycled" gemstones and heirloom diamonds. Diamonds: All of the diamonds used to create the John Paul Signature line as well as our custom designed work utilize conflict-free diamonds. John Paul Designs fully supports the Kimberley process, which is an International process used to track and certify diamonds. In April 2003, congress and President Bush passed a law adopting the Kimberley Process - a certification scheme that requires all US diamond retailers to buy diamonds from manufacturers who have documentation warranting that the merchandise was obtained through legitimate channels. Today, the US Customs Service actively enforces the Kimberley Process requirements as diamonds enter American ports. The Kimberley Process is by no means perfect, though we stand behind it while it becomes more standardized. Displays: Nearly all of the cases & displays at our gallery are old artifacts and objects of interest that John Paul found while "making his rounds" as he likes to call it, antiquing and junking. Over the years, this has led to a fair amount of people who bring things they see that remind them of JPD's displays. Occasionally, some people find his displays more interesting that the jewelry! Egad! Packaging: We strive to use as many American made items as absolutely possible. From our hand stamped Kraft bags, to the light bulbs in our fixtures, we are relentless in pursuing the origin of an object and doing our best to support local makers & USA manufacturers. Belief: A friend of his once said, "I want everything in my house to be beautiful, so no matter where you look or what you touch, you see or handle something beautiful." John Paul identified with that wish, and felt at ease knowing that he wasn't alone. This deeply held belief continues to inform every piece that he designs and creates. I tend to work in a variety of metals not always found in traditional jewelry stores. The most popular metals I work with include: Platinum, Palladium, Gold (all colors and karats), Silver (Pure Silver, Sterling Silver, Palladium Sterling & Platinum Sterling), Iron, Stainless Damascus Steel, Mild Steel, Stainless Steel & Copper to name more than a few. An often misunderstood metal is Gold. In its purest 24k form, Gold is fairly soft with a rich, burning, yellow orange hue. To create other colors and karats of Gold, other metals are blended with pure gold to create an alloy. Metals are alloyed to change their color, or change their hardness, or both. For this reason, 10K Gold is harder than 18K Gold as it has less Gold in the mix and more alloy metals such as Copper, Zinc, Silver, etc. When designing rings, I take into consideration the density and durability of the material I am using, so that you can rest assured that ring will most likely last you a lifetime. Platinum: Platinum is one amazing metal. It is often the most misunderstood even in the jewelry trade. It is rare and heavy. And the part that is most often misunderstood is its durability. Most often, instead of the word durable, the word hard is used. Platinum is not hard. Platinum is soft. But before you decide you don't want a soft metal for a ring, hear this. Platinum will outlast any other material by over ten times. The reason being is this: when you scratch your gold wedding ring while working on your bike, the small divot created by the scratch removes a tiny amount of metal. Platinum on the other hand, when scratched, is merely dented or smudged like a fingernail scraped across soft clay. No metal is removed. And not only is no metal removed, the metal that was "parted" if you will, was compacted. We refer to this as work hardening. On a very small level, that tiny scratch on your Platinum ring compacted the molecules of the metal and this in turn makes the metal harder. So over time a well-worn Platinum ring is harder than the day you received it. Another side of that coin is that platinum is not for the shiny crowd. If you like a shiny, polished ring, platinum probably isn't your metal. I think of platinum like a leather belt or jacket. It just gets more beautiful with age. This is one reason that my textures look beautiful in platinum: the texture "conceals" the bumps and dings better. "Days before the holiday proper, John Paul Designs announced a “Show Us Your Christmas Spirit” contest on Facebook. Revelers were invited to swing by and display as much Yuletide “razzle dazzle” as they could muster. Their photos were posted, and prizes — including a custom silver pendant — awarded for the most “likes.” One woman brought in a decorated 7-foot white Christmas tree; another showed up as Santa, bearing beer. “There were lots of votes cast, good hype, and we got quite a few new fans out of it,” says Amy Castaño, who handles marketing for the store."